Laura Giaritta is the former wife of Vanilla Ice (birth name – Robert Mathew Van Winkle). Vanilla Ice’s wife Laura Giaritta was born in 1971 to Elaine Giarritta and Thomas Giarritta. She has an older sister Renee. Laura is 45 years old in 2016. Laura and Vanilla Ice started dating in 1995 (she was 24, he was 27), a year after Robert’s suicide attempt. Robert was struck by love when he met Laura and still has her name tattooed on his wrist. In 1996, Vanilla Ice’s wife and her spouse opened up an Extreme sport store in Miami, which they named after Ice’s album – “2 The Xtreme”. The couple tied the knot in 1997. Their first daughter, Dusti Rain was born in 1998 and their second daughter, KeeLee Breeze – in 2000. Laura and Rob had been together for 16 years and married for 14 years, until they split in 2011. Laura Giaritta Van Winkle and her husband had a very rocky relationship. In 2001, Ice was arrested in Florida for assaulting Laura after the two had engaged in a major argument as they drove. Robert had to go on probation and attend family therapy sessions. In 2004 Laura’s husband was arrested again after assaulting his wife of seven years. In 2008 he was booked into Palm Beach County jail on a domestic battery charge after assaulting Laura again, allegedly after learning that she had been unfair. The rapper has moved out of their Florida home. He was ordered by a court to stay away from his wife and only contact her via telephone. Once in an interview Vanilla Ice wife Laura mentioned that they “had problems for a long time”. At their good times, the couple seemed totally devoted to each other. Laura was always admired by Rob’s intelligence and him being a very protective father. Rob had always loved her. Their lifestyle was a comfortable one. Laura liked to purchase Louis Vuitton purses because the LVs were also her initials. Their daughters attended private school and were into horses. The oldest one, Dusti wanted to be a singer some day. Now Laura’s teenage daughters (17 and 15) like to watch modeling and runway reality shows. Even after their split in 2011, the two keep in contact. Laura Giaritta and Vanilla Ice were photographed attending the screening of the comedy film “That’s My Boy” (Vanilla Ice starred as himself in this movie) in 2012 in West Palm Beach, Florida. According to some sources, the 45-year-old Vanilla Ice’s wife is currently living in a lovely residential area in Wellington, FL – only a half hour drive from West Palm Beach. In the past, her and her family lived in different places throughout Florida, including: Lake Worth, Fort Pierce, Fort Lauderdale, Miami Beach, Sunny Isles Beach, and Miami, FL. There daughters are really sweet! Vanilla Ice is a great dad. 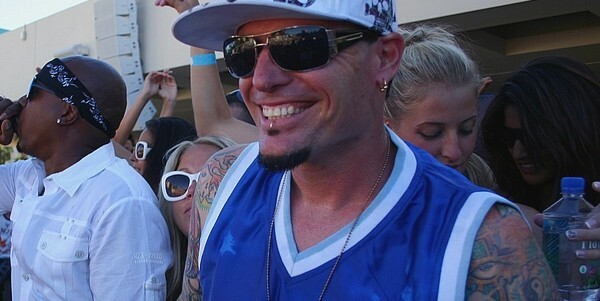 What is the TRUTH about the reality of Rob VanWinkle (Vanilla Ice) and Laura’s marriage. I read newer articles that say they r still married, u say they divorced in 2011? A VI fan & FL resident..